Makers sweeps you into an inclusive community of artisan craftsmen, preserving time-honored elements of both art and craft to produce the most trusted performance fabric in the world. 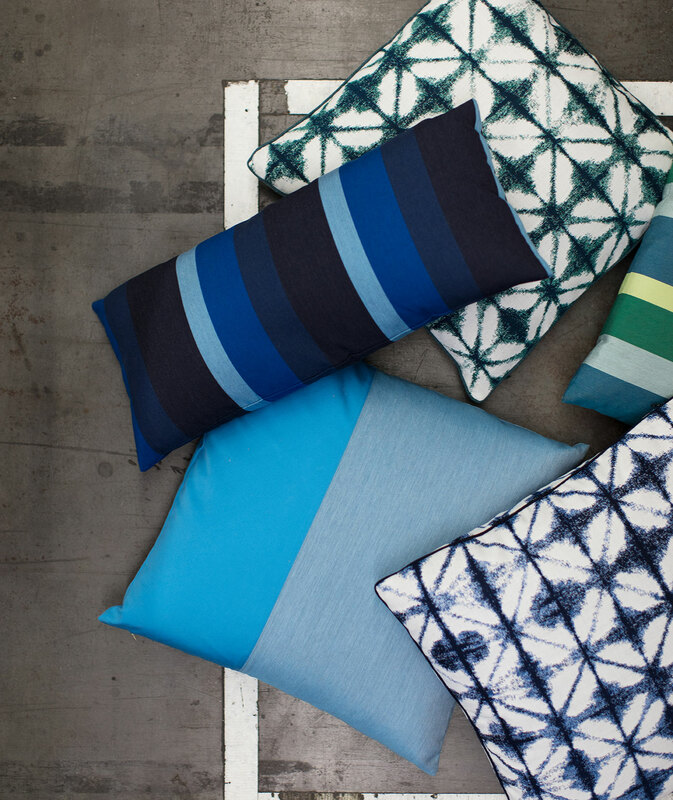 Inspired by traditional techniques such as backstrap weaving and Japanese Shibori dyeing, Sunbrella Makers fabrics embody the unique personality of handmade. Blend is a textural solid woven with our mélange yarn to give color and depth with the aesthetic of a heavy wool. Available in a number of neutrals and colors ranging from muted to deep saturated tones. Canvas is a staple in the portfolio of Sunbrella fabrics, and is a popular choice for a number of upholstery applications, pillows, cushions, umbrellas, and more. 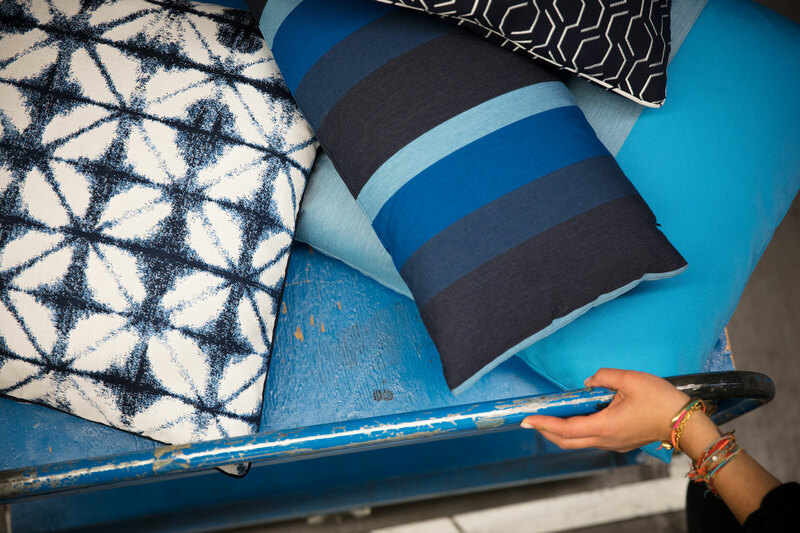 Makers introduces a new color of the popular fabric in the bright Cyan hue. Cast introduces a soft texture woven with heathered yarns, casting a grey overtone to evoke a vintage aesthetic. Five new colors of Cast are included in Makers. 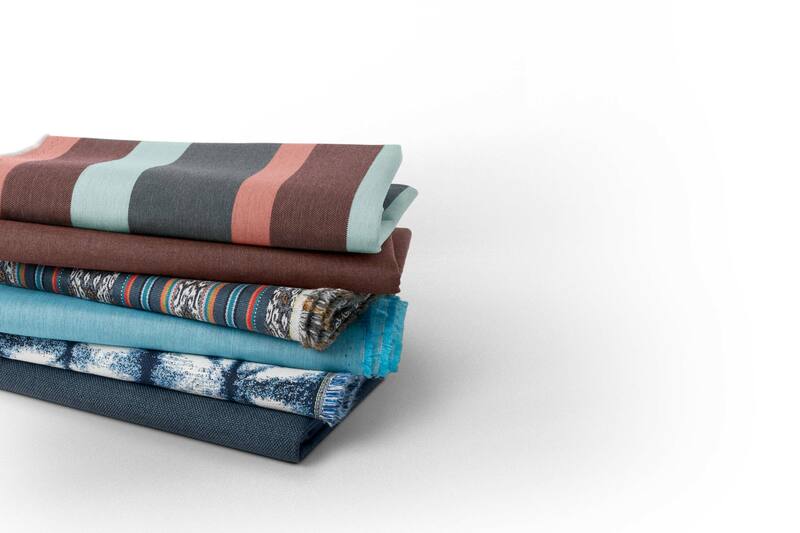 Spectrum serves as a staple base cloth, featuring a subtle texture and a soft hand. Layer Spectrum with other Sunbrella textures of a similar hue for an on-trend look. Makers brings three new colors of Spectrum. Mixing matte colors with metallic accents, Adaptation showcases the influence of technology on modern weaving, creating a pattern that is reminiscent of hand-forged metal designs. Inspired by traditional Japanese dying techniques, Midori offers a truly handmade look that captures the authentic nature of this art form. Paradigm is a traditional menswear-inspired pattern. Make it your own by pairing this transitional pattern with contemporary and artisanal patterns throughout the collection. Artistry is inspired by Peruvian weavers, mimicking a backstrap handwoven textile. The result is an authentic, unique fabric with a handwoven aesthetic. Cultivate is a lively, multicolored fabric. It’s small scale complements the more contemporary Gateway, a large-scale stripe. Gateway is an asymmetrical stripe that contrasts blended tones with solid, opaque color. Pair this contemporary stripe with the handmade-inspired patterns in the collection. Makers introduces 4 new color combinations. A classic bar stripe, the new natural colorway of this pattern complements the textures and patterns throughout the collection. Mix and match Tradition with other textures and patterns in the collection.